And now for something completely different: Pacifica Spindrift Players presents the fantastic musical “Little Shop of Horrors” which opens on its Main Stage on Friday, February 12. Directed by Mike Lodick, who brought this community the hit Gallery production of “The Gin Game” last Summer, “Little Shop” provides the unique opportunity to see a larger-than-life carnivorous plant interact with amazing singers and dancers. Lodick, who has been involved both onstage and offstage with multiple PSP productions over the past few years, is excited about showcasing his vision of this show, which he describes as a “fun house mirror view of popular music of the ’70’s.” Lodick acknowledges it would be too easy for this musical to evolve into “total camp,” and is working closely with his actors to bring out the human emotions and real struggles of the wonderful characters who populate his Downtown Skid Row. Lodick was drawn to direct this show because of its appeal to audiences, stating: “The themes of temptation and the cost of quick success are pretty universal. I think people will relate to Seymour as he strives for a better life, and is tempted with overnight riches that come at a heavy price.” In addition to the fantastic story, the amazing and memorable music (brought to this stage by music director Louis Lagalante in his PSP debut), and incredible choreography (by Morgan Dayley, Out of this World), Lodick encourages patrons to come see the technical wizardry and puppeteering magic (courtesy of puppeteer Jeremy Judge, 4000 Miles) that goes into bringing Audrey II, the huge plant from another planet, to life before your eyes. 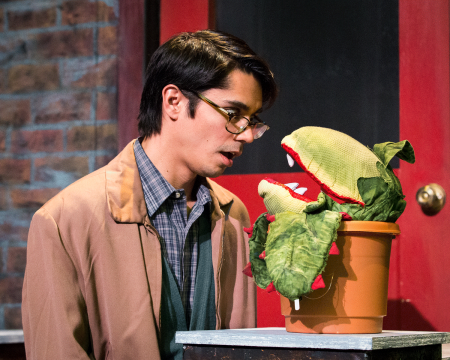 ‘Little Shop of Horrors’ plays for 4 weekends! Get your tickets early, as this popular show will sell out – you can call the Box Office at (650) 359-8002 or purchase online today!